Orange County Mayor Teresa Jacobs joined three local families at the Taft Neighborhood Center for Families (NCF) to help select gifts for their children during the Center’s annual holiday shopping event on Dec. 14. The toys that were up for selection inside the Center’s Holiday Toy Land were donated as part of Mayor Jacobs’ 2015 Holiday Heroes Toy Drive, which collected more than 5,100 donated gifts this year, far surpassing last year’s total of 4,655 toys. Once families made their selection in Holiday Toy Land, Mayor Jacobs joined the families to help wrap the gifts. This year began a new tradition for Mayor Jacobs’ signature holiday initiative in which the families were also given grocery items, including a frozen turkey, to make a homemade Christmas meal. The NCF is a community-based collaborative of area public schools, government agencies, churches, grassroots organizations and nonprofit service providers that offer friendly assistance to the children and families of Orange County. The families who participate in the annual toy shopping event are usually referred by NCF service providers, who work to identify local families who have the greatest need. Orange County employees, volunteers and the extended community have contributed greatly to the success of Mayor Jacobs’ Toy Drive. Since 2011, more than 17,250 toys have been distributed to children up to age 18 through several community organizations, including Wraparound Orange, Neighborhood Centers for Families, Orange County Public Schools’ Homeless Program, the American Red Cross and the Community Food and Outreach Center. This year, Orange County Parks and Recreation was again the County division that collected the most toys with 1,950 toys and gift cards. Other large donor divisions include Orange County Corrections, which collected 567 toys; Utilities donated 326 gifts; Fire Rescue gave 257 toys and Public Works loaded a truck full of 206 unwrapped presents for the Toy Drive. Other contributors included Orange County’s Family Services, Convention Center, Environmental Protection, Planning, Human Resources, the Regional History Center, County Administration, Communications, Information Systems and Services and Animal Services. Upon collection, all toys donated to the Holiday Heroes Toy Drive are sorted by age and gender, a task which is only accomplished through countless employee and volunteer hours. This year, Orange County Government teamed up with Orlando Date Night Guide Founder and Editor Kristen Manieri who organizes a special date night volunteering event called Do Good Date Night. During the Holiday Heroes Do Good Date Night, 20 couples helped sort more than 600 toys. Once again, FOX 35 was the official media partner for the Toy Drive. Fox 35 donated airtime, including a special live segment during their morning show Good Day Orlando filmed on-site at the World’s Finest McDonald’s on Sand Lake Road as well as a segment at the Orange County Regional History Center’s annual Holiday at Heritage Square. Additional partners and drop-off locations included The Dr. Phillips Center for the Performing Arts, local co-working tech space Canvs, Psi Chi International Honor Society University of Central Florida/Orlando Chapter, the Orlando Chapter of American College of Nurses-Midwives and Valencia College. 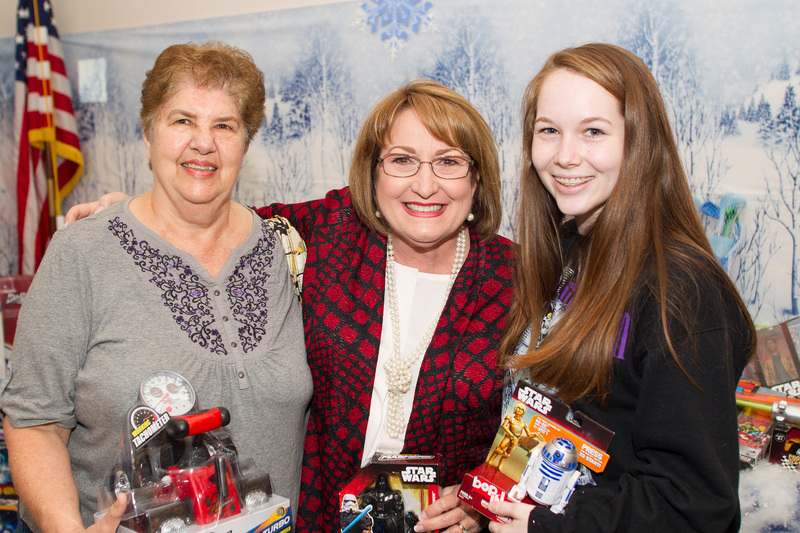 To view more photos from the holiday toy shopping event visit Mayor Jacobs’ Flickr album.